2014 is going to be an eye opener for people in the city world for electric cars and the technology they capture. 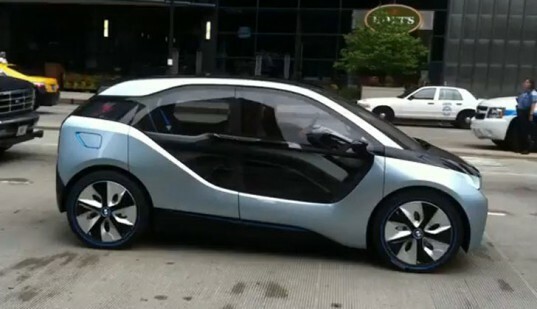 With BMW always at the head of the pack, this i3 will be available to use in 2014. We saw an idea of an i8 but this was a video captured by a car fanatic realizing he must get this on film before anyone else does. The i3 is supposed to get about 80-100 miles on a single charge! That's perfect for living just outside the dense city, to come into town, and still have charge to go home. It is also said to have 170hp! And can reach 0-60 in 7.9seconds! For an EV, that's impressive when only spending $35,000 on a BMW. And what about charging in a hurry? BMW has said that you can do a quick charge setting and charge up to 80% of power in under an hour! Plus the style is pretty sleek too. Carbon fiber and aluminum trim and structure make this EV lightweight and yet strong to handle any sort of unexpected impact. Look for this at the Frankfurt Motor Show this year.